In this week’s issue of MCN we pay tribute to 2006 MotoGP world champion Nicky Hayden, who succumbed to injuries sustained following a crash while training on his bicycle in Italy. This weekend Ian Hutchinson, Michael Dunlop, Guy Martin and the rest will set off down Bray Hill for the opening practice session of the 2017 Isle of Man TT, and this week we have a free 32 page preview with exclusive interviews and insight you won't find anywhere else. All the news from a dramatic weekend of racing at Le Mans as both Valentino Rossi and Marc Marquez crashed out of the race and MotoGP rookie Johann Zarco finished in second place. When it comes to kicking back and enjoying the ride, nothing beats a modern classic. We tested the Honda CB1100 EX, BMW R nineT Pure C and Triumph Bonneville T120 Black to sample three different flavours of the retro scene. Ducati's 1299 Superleggera is the pinnacle of superbike technology with a carbon-fibre frame and swingarm and new electronics which make it the most savage superbike we've ever ridden. PLEASE NOTE: News of Nicky Hayden's passing reached us while this week's issue was being printed. 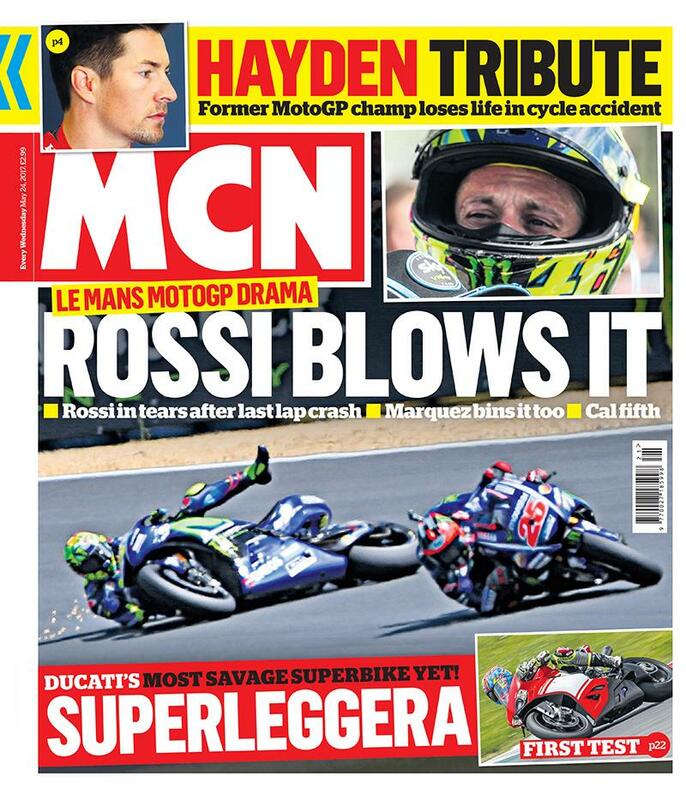 The presses were stopped, and the tragic news of Nicky's passing was included – but some newsagents will have the original issue of issue of MCN, which reports Nicky Hayden's situation as 'critical'.